Thomas: Paul, Will, and Betsy, thank you so much for agreeing to answer some questions for my blog. Paul: You’re welcome. Thanks for the invitation. I’d like to start by noting that my brother Will was my best man. In his speech he noted, repeatedly, that I, repeatedly, like cheese, repeatedly, very much. In honor of that time, and since that is true, I am choosing to answer this question from the perspective of a person who loves cheese very very much. You get to pick one superpower: ability to produce endless confetti, ability to taste sound, or the ability to talk to the comic book character Archie. What do you choose and why? Paul: Hmmm... let’s see. Confetti ≠ cheese, so not that one. Taste sound? The sound of cheese slicers, the cheese factory.... cutting the cheese? um. . .
How about the ability to talk to Archie? That’s classic cheese, man. Plus, there’s no dude cooler than Archie. Betsy: Oh my goodness, it would SO be talk to Archie...he's being killed off in one of his story lines this summer and he needs a heads up! For my 24th birthday my husband threw me a big surprise party with boatloads of confetti. It's been 13 years, and I kid you not, I still find confetti. I hate confetti. The person able to produce endless confetti would be my arch nemesis! Thomas: What state do you think should be kicked out of the union? What have you done to make that happen? Will: Does Northern Illinois count? As a resident of Southern Illinois (real Southern Illinois, not just an hour outside of Cook County), it is clear that the state of Illinois is screwed politically. Since well over half of the politicians in Illinois are from Chicago and the corruption is well-known, it is therefore evident that Chicago politics is the root of the worst economic mess in the Union. I would accept Southern Illinois being annexed by Missouri or Indiana if possible. Paul: Well, certainly not Wisconsin! Ok. According to the USDA, Mississippi has only one Dairy plant processing any sort of dairy product. As deplorable as that statistic appears, Wyoming actually has none. That’s simply un-American. How can you have your state be on the map but produce no cheese or ice cream? I say we kick them out. Then we can have a big giant square lake right off the Black Hills. Yeah! Betsy: Wisconsin should be kicked out of the union. Seriously, have you ever been stuck behind a driver from Wisconsin? Slow as molasses. What have I done to make that happen? I bad-mouth their drivers every chance I get...when I get stuck behind a very slow driver I assume they're from Wisconsin. Wouldn't you know, at least half the time they are! Thomas: Paul and Betsy: Will is an internationally known indie author. Seriously, people know him, why did you go ahead and put your name on a book with him? Paul: Well, when you think about it, its really just combining three different cheeses into one pot. When you put us together its a delicious fondue. Betsy: 3 reasons. #1 He's internationally known. Seriously, people know him...it's a great way to get started. #2 He's my brother. #3 I suspect he may be the next Doctor and I'd really like to say I was a part of that. Thomas: Pick only one: reduce, reuse, or recycle. Will: RE-USE. Seriously, last week I left some clothes at home when I went on a family vacation and I ended up having to wear the same pair of socks three times in a row. Better than none, I guess. Reuse? Over and over and over and over? yep. Recycle? I’m not sure how that works and I don’t really want to know. Betsy: Wow. You really pick hard questions, don't you? I choose reuse. That's why all my books have been read about 600 times...I reuse them, over and over and over. Mostly when I should be doing other things. 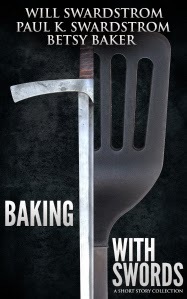 Thomas: What led you to choose the story you wrote for Baking with Swords? Will: My story, A Whimper, is about the end. The end of the world, the end of civilization, the end of everything. I've read a lot of post-apocalyptic stories where there are wars, journeys to find the answers to life, and epic conclusions. I wanted to show that it may not exactly end like that. Instead of with a bang, perhaps humanity goes out with a whimper. Dylan Thomas urges us to "not go gently into that good night," but more and more I see society embracing an apathy and a laziness that belies that admonishment. It was originally to be just a story I would quietly publish on my own, but then when Paul and Betsy had their own stories, I decided to take them all and publish a family collaboration. Paul: It was a bit of a combination of life’s frustration and inspiration from my brother, Will. Its a story of a young man facing the conflict between his calling and the dedication to his family. The young man has to face up to that conflict in this story. Unfortunately, no cheese. Thomas: Thank you for taking the time to answer my questions. I wish your book lots of success. Paul: Thanks for having me. Please note, as Will perhaps overstated my love for cheese in his Best Man’s speech. It may be true that I overstated it here as well. Maybe. Note: Thomas Robins has known Will for some time online, but this was his first contact with Paul and Betsy. Check out the link below and buy the book!